Check for $2,500 paid for 1% of “Xtagged” – part of securities fraud case against Andy Esquivel. 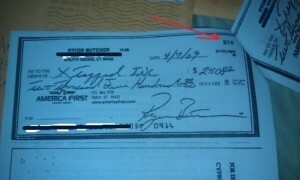 We paid Ryion $2,500 through Logan Laws 09/14/2009 look below [at picture of check to the left]… after we gave Logan $2,500 Ryion was supposed to remove negative blogs he never did so we never paid remainder $2,500! By reading the text above you would think that the check pictured was made out to Ryion Butcher, right? In fact close inspection reveals that the check pictured is the one Ryion Butcher wrote to Andy Esquivel in exchange for 1% of his Xtagged scam. The text in Andy’s post has absolutely nothing to do with the check in the photo. Note: accepting a ‘check’ in exchange for a ‘share of ownership’ in a company (real or fictitious) is BY DEFINITION a “securities transaction,” yet Andy Esquivel is going to try to make the case at trial that he never sold any securities. 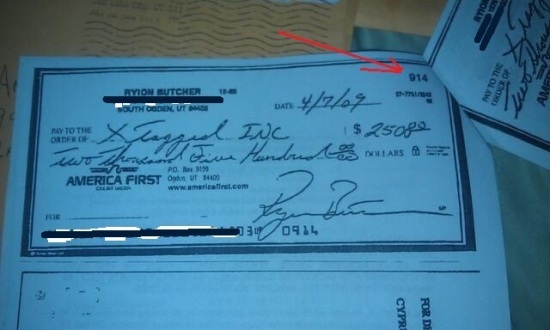 In other words, here’s Andy trying to convince himself that the pictured check proves he tried to pay Ryion Butcher back, when in fact all it does is provide further evidence of the fact that Andy committed securities fraud as charged. It’s amazing how the minds of crazy people work. Looped logic, delusions of grandeur, fantasies of persecution – it’s no wonder poor Andy can’t get a job.